Use our guide to find the best hamster cage for your pet. If you already know how to use this guide, scroll to the bottom to see the entire list of cages. Otherwise, read on to see what features you should pay attention to when choosing a cage. What type of cage is the best? Wire-top or bar cages with a plastic removable tray have better ventilation and are easier to clean. 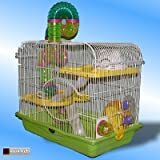 These are the most basic, no-frill cages available on the market for hamsters. However, the removable trays tend to be shallow so bedding might get kicked out of the cage if you put in too much. Some hammies also chew on the bars, creating a lot of noise (not a good idea if your cage is in your room) and can cause the cage bars to rust when the hamster’s saliva reacts with the metal. 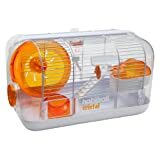 Plastic modular cages such as Habitrails and Crittertrails are expandable and come with a wide range of add-ons and tubes so you can build your perfect hamster cage. But they are harder to clean and have poorer ventilation. Newer designs feature better ventilation by using metal bars for some parts of the cage. What I really like about plastic modular cages is their almost limitless potential for customization and expansion. There are numerous accessories and add-ons that you can expand these cages with and they can be fun to collect too. Aquariums and glass tanks allow you to see your pet easily but are heavy so you can’t move them easily. You could use a very thick layer of bedding (which your hammy will love) and not have to worry about it spilling out of the cage. Glass tanks and aquariums do not come with well-ventilated covers suitable for hamsters so you may have to create a DIY one. 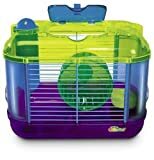 If the tank is for dwarf hamsters and the accessories are placed in such a way that the hamster cannot escape, a cover may not be needed. Syrian hamsters will most likely escape an uncovered tank though. Some people use a tank topper but we do not recommend it as hamsters are not very good climbers and may fall off the top and injure themselves. Know an amazing cage that we should add to the list? Let us know in the comments below! 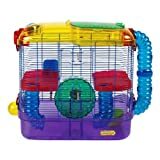 I would like to switch to a wire cage for my little robo Petal, but to be honest, most of the cages pictured here appear to have too much space between the wire for a dwarf hamster. I understand that they can squeeze through very small openings and I can’t afford to have her escape (we have a cat and a dog in the house). She is in a large glass aquarium with a mesh top and although I have had no problems with this setup yet, I am worried about the summer temps we’ve been having and whether or not she may be too hot. I have a small fan setup that is circulating air around her cage, and thus far she has not shown any odd behaviors that would indicate she is having any kind of trouble. I’m just thinking that it might be better for her to have a more open cage. Suggestions? I have a small robo dwarf named muffin. She is so far, very shy. I currently have a crittertrail with levels, and then a smaller one that we are going to attach. I hope that she enjoys her setup when it is finished, as we tried our best. She is settling in pretty good, but man, that wheel makes a lot of noise! My friend has a silent spinner that she is giving me, hopefully it’s the right size. None of these cages are safe for hamsters but okay . . . There is a minimum of 40 gallons and 800 square inches. 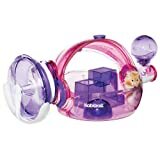 “Many experienced hamster owners recommend at least 360 square inches of space for a hamster to be comfortable” are you serious? 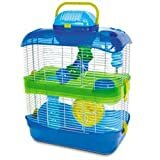 A hamster can barely be comfortable in 800, let alone 360!!! 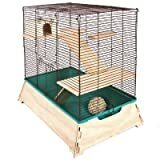 The crittertrail and habitrail cages shouldn’t be recommended. They do not simulate the hamster’s instinct to burrow, that is what bedding is supposed to do. The hamster barely spends any time underground when in the wild, stop promoting fake ideas. Try an IKEA detolf cage, which is 1000+ square inches and can easily house up to 4 dwarves and 1 Syrian. You’re exactly right. This blog is awful for recommending those awful cafes.